Million Minds is a raising training, skilling and consulting organization and specializes in the domains of Supply Chain Management & Logistics, Retail, and Manufacturing. 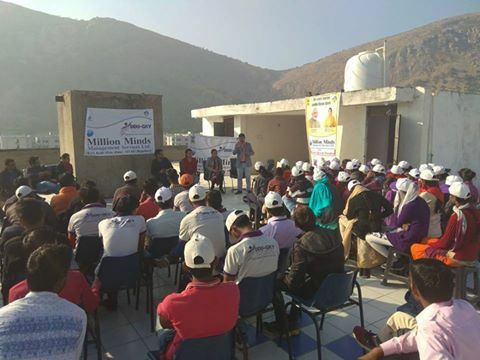 Million Minds skills is working with the State government program Deen Dayal Upadhyaya Grameen Kaushalya Yojana (DDU-GKY) to implement their Skill Development Initiative. Deen Dayal Upadhyaya Grameen Kaushalya Yojana (DDU-GKY) is the skilling and placement initiative of the Ministry of Rural Development (MoRD). DDU-GKY has its origins in the Aajeevika Skills programme and the ‘Special Projects’ component of the Swarnjayanti Gram Swarozgar Yojana (SGSY). The scheme focuses on catering to the occupational aspirations of rural youth and enhancing their skills for wage employment. Creating opportunities for youth through Skill development. Promote entrepreneurship among the youth. Providing Industry relevant skill training. Catalyze the creation of large quality vocational training Institutes. Update Skills through significant industry involvement. We cater to the training needs of school drop-outs, X/XII grade pass-outs, ITI students/pass outs, college graduates (including engineering graduates) and various other learner groups. The learner centric approach ensures a strong foundation of skills for employability and smooth transition from classroom to workplace. Our training programmes are standardized and employment oriented. These are designed to offer industry endorsed and technology driven modules for various learner segments. Our Skills for Jobs programme links every trainee to placement in organised / semi-organised sector through industry endorsed training. Today, we offer many programmes, across various sector, including logistics, apparel, automotive, beauty and wellness, banking and financial services, capital goods, construction, electronics, hospitality, healthcare, power, retail, telecom, textile etc. For us skill development is an imperative to youth engagement and poverty alleviation. We have created a model as per govt. norms which is nationally recognized for its impact and innovative ways of improving the way people acquire skills and how industry retains manpower.